Marika Kilius (1943) is a two-time Olympic silver medalist and two-time World champion in pair skating. She also appeared in German films, together with her skate partner Hans-Jürgen Bäumler. Czech postcard by Pressfoto, no. S 12/2, 1964. Photo: Zdenek Havelka. Kilius and Bäumler won a Silver Medal at the IX Olympic Winter Games in Innsbruck (1964). With Hans-Jürgen Bäumler. German postcard by Alpiner Fotoverlag A. Blumenthal, Garmisch-Partenkirchen, no. 110, 1964. With Hans-Jürgen Bäumler. German postcard by ISV, no. H. 115. With Hans-Jürgen Bäumler. German promotion card by CBS. German postcard by Franz Josef Rüdel, Filmpostkartenverlag, Hamburg. Photo: Marina Bäumler. Marika Kilius was born in 1943 in Frankfurt am Main, Germany. She was the daughter of a hairdresser and at the age of 4 she already learned to skate. Kilius began as a singles skater but picked up pairs very early. Her first partner was Franz Ningel. They placed fourth at the 1956 Olympics and won the silver medal at the 1957 World Championships. Kilius was still a child when she was paired with Ningel, who was more than six years her senior. 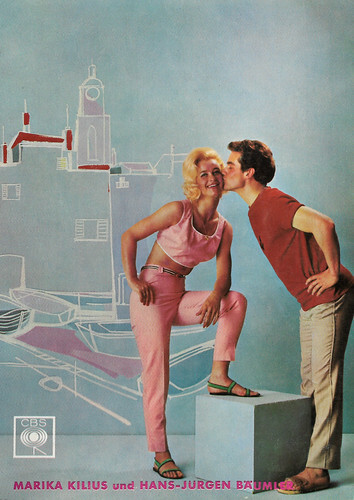 By 1957 she had grown to be taller than he was, which caused problems on their lifts, so the team split. For a time following her split with Ningel, Kilius competed in artistic roller skating as a singles skater. She was the World Roller Lady Champion in 1958. Meanwhile, in 1957, Kilius began skating with Hans-Jürgen Bäumler under the tutelage of Erich Zeller. Between 1958 and 1964, Kilius and Bäumler won the German Championships four times, European Championships six times and the World Championships two times. Their first World title, in 1963, followed cancellation of the 1961 event due to the crash of Sabena Flight 548 and a collision during their performance at the 1962 World Figure Skating Championships that forced them to withdraw. Marika Kilius was voted the German female athlete of the year in 1959. Dutch postcard, no. 1162. Photo: CBS Grammafoonplaten. Dutch postcard by Muziek Parade, Hilversum, no. AX 6092. With Hans-Jürgen Bäumler. Dutch postcard by Uitg. en druk. 't Sticht, Utrecht, no. 6120. 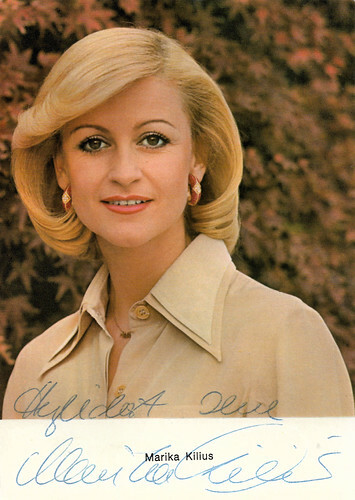 German autograph card. Photo: Fritz Frischmann, 1964. Here, Marika Kilius performed in the Wiener Eisrevue in Luxembourg. 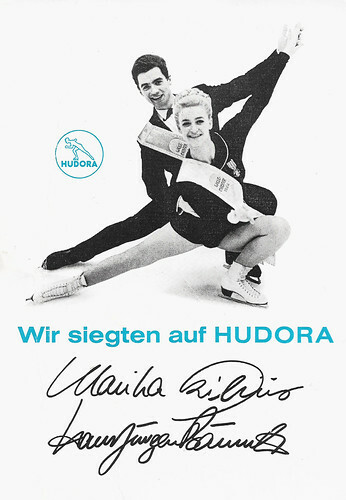 German promotion card by Hudora-Schlittschuhen (skates). Caption: Wir siegten auf Hudora (We won on Hudora). Marika Kilius and Hans-Jürgen Bäumler also captured the silver medal at the Olympics twice, in 1960 and 1964. In 1966, it was alleged that the team had signed a professional skating contract before the 1964 Winter Olympics - against the rules at the time - and they were stripped of the medal. 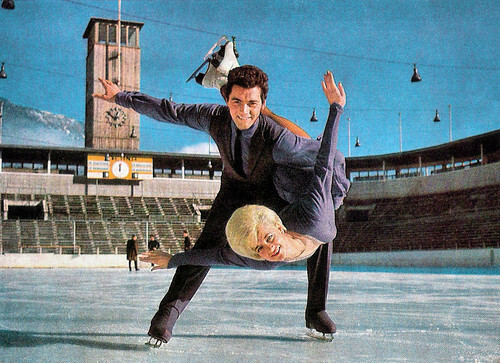 In 1964 they had professionally skated for Holiday on Ice. The IOC dismissed the charges in 1987, reinstated the original results, and Kilius and Bäumler were re-awarded their silver medals. Both Kilius and Bäumler became singers of Schlagers, the German version of pop songs. 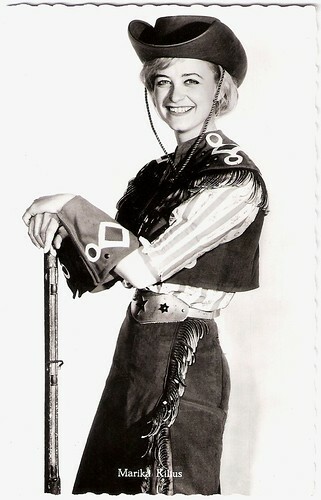 Her debut single, Wenn die Cowboys träumen (1964, When the Cowboys Dream), shot to number two in the German charts and spent four months in the top ten. Also successful was her duet with Bäumler, Honeymoon in St. Tropez (1964). 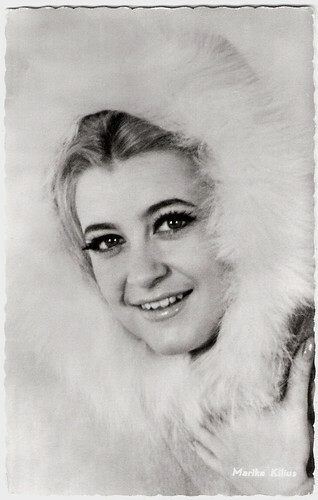 Reportedly her skating was better than her singing and her voice was replaced by that of background singer Leonie Brückner. Further lightweight solo singles failed to maintain the momentum. That same year, Kilius suddenly married Werner Zahn, the son of a factory owner from Frankfurt am Main. This happened just before the premiere of the film Die große Kür/The Big Kür (Franz Antel, 1964) with Peter Kraus, in which director Franz Antel had wanted to present her and Bäumler as a new Traumpaar (romantic dream pair). However, the film still became a huge success, and they made a sequel, Das große Glück/The Lucky Strike (Franz Antel, 1967) with Theo Lingen. They reunited for the comedy Einer spinnt immer/One always spins (Franz Antel, 1971) starring Georg Thomalla, in which they had cameo appearances. Kilius divorced Werner Zahn, and her second marriage, to American businessman Jake Orfield, also ended in a divorce. She has two children, Sascha and Melanie Schäfer, and two grandchildren. In 2008 she and Hans-Jürgen Bäumler reunited as jury members for the German TV show Dancing on Ice. A year later she had a supporting part in the film comedy Rabentage/Ravens Days (Thomas Haaf, 2009) and she continues to appear regularly on TV. Marika Kilius introduced a cosmetics line, Beauty on Ice, in 2012, and in 2013, she presented her memoirs, Pirouettes des Lebens (Pirouettes of Life). German postcard by Filmbilder-Vertrieb Ernst Freihoff, Essen, no. AX 5891. Photo: CBS-Schallplatten. German postcard by Filmbilder-Vertrieb Ernst Freihoff, Essen, no AX 6160. Vintage postcard. Photo: Schirner, Düsseldorf. Caption: Marika Kilius and Hans Jürgen Bäumler, World Ice-Skating Champions. German autograph card by Cantor, Wiesbaden. 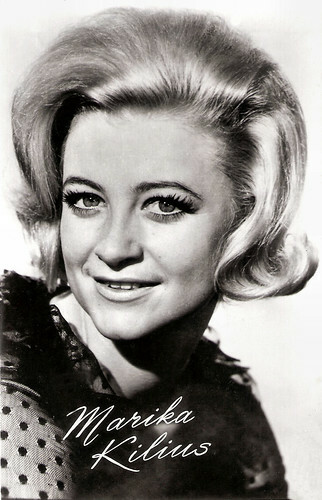 Marika Kilius sings Erst kam ein verliebter Blick (1965, First Came A Lovely Glance). Source: Megayoyo1992 (YouTube). 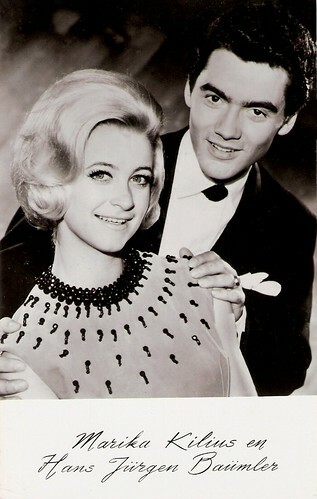 Marika Kilius and Hans-Jürgen Bäumler in Das grosse Glück (1967) with Eva Pawlik and the Wiener Eisrevue. Source: Erksun Koca (YouTube). Sources: Ready Steady Girls!, Marika Kilius Offical Website, Wikipedia (English and German) and IMDb.